At Tolko, we’ve invested time and resources into reengineering our APA-rated Sturd-I-Floor products. Moisture-resistant and edge-sealed, Tolko T-STRAND™ T&G OSB subfloor resists warping and stays true longer. Tolko T-STRAND™ OSB panels are improved, warrantied, and ready to perform. Our enhanced subfloor was developed specifically to meet the challenges of wet building climates. Ideal for construction seasons or projects at risk of weather exposure, Tolko T-STRAND Pro OSB T&G subflooring offers greater dimensional stability and superior moisture resistance. Rain or shine, Tolko T-STRAND works as hard as you do. Your choice of material can make your product better and life on the job-site easier. 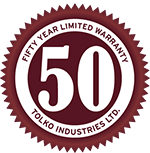 At Tolko, we are constantly innovating to bring you the easiest to use, most durable product we can. We’re proud to bring you a well-made, well-designed product. Pro performance: 45% less swell and double the internal bond of standard grade OSB T&G Subfloor. Tested: APA-certified PS2 for guaranteed consistent standards. No slip surface: Manufactured with a continuous press, this subfloor does not need to be sanded to meet thickness tolerances. By not sanding, we are able to offer an imprint screen, no-slip face. Superior moisture durability: This enhanced subfloor is unsanded, which preserves the integrity of the strands and maintains a protective wax surface for greater water repellency. Proprietary Edge Seal: Blue edge seal protects the panel from swelling. Fastener guide: Ink-jetted nailing guide on the panel face makes for convenient, easy installation on common joist spacing. First-class packaging: Packaged in bags and protected with cardboard shrouds. Packaged install side up: Installers no longer have to flip panels. The lifts are packaged face up, making it simple to slide the panels off and lay them down. Indoor air quality: Contains no added urea-formaldehyde resin (NAUF). No-nonsense, transferable, 365-day no-sand, 50-year limited warranty. View warranty for full details. Tested to a PS2 grading standard and certified by APA –The Engineered Wood Association—Tolko T-STRAND™ OSB Subfloor features greater strength and resistance to shearing. The panels have improved durability and increased stiffness for less deflection when walked on. 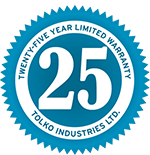 No-nonsense, transferable, 25-year warranty against delamination. View warranty for full details. Call our OSB Sales Team to ask about residential flooring.